Here at Dreamsocket, we’ve been doing Android development for years. And we’re always trying to improve our process and add to our tool chain, allowing us to deliver higher quality apps in less time. A big push we’re currently on is getting unit and UI testing integrated into our build process. Unit tests verify individual units of logic: does this method return what it should when it is passed specific parameters? What happens when incorrect or senseless parameters are passed? Unit tests are not run within an Android app, so there is no context. So it’s not really possible to do any kind of testing of UI objects (anything that extends View). In some instances, you may be able to create a mock context (see Mockito) and create an instance of a custom UI object and test some of its non-UI logic, but in practice, something in that class is eventually going to call some non-trivial method on the mock context and it’s going to crash. So unit tests are really for testing data objects or classes that manipulate data objects or perform the business logic of the app. Note that you can unit test a class that accesses UI objects. You’d just need to mock those objects, so that you aren’t attempting to create actual UI objects. UI tests actually create a context (they actually instantiate an activity or service), thus they can instantiate and run View-based UI objects. Espresso has methods to locate specific views and perform user actions such as clicks, presses, gestures, text entry, etc. on individual components of those views and verify the state of views after these actions have been performed. 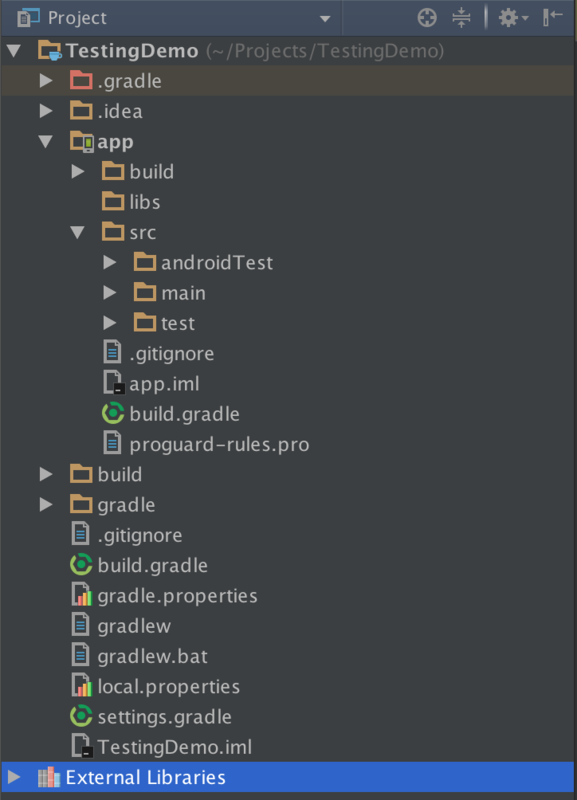 For JUnit unit tests, you’ll need to add some “testCompile” dependencies in your app’s gradle build file. These go in the “dependencies” section of the build file. Mockito is optional, but is useful for creating mock objects to use in your tests. 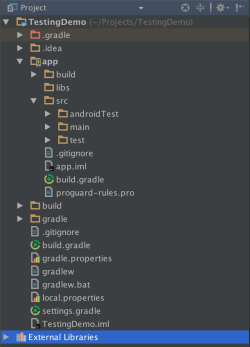 For Espresso UI tests, you’ll need to add some “androidTestCompile” dependencies. The app itself possibly has a dependency for the appcompat library like so. This lets the app know how to run your tests. The test classes for the two types of tests go in specific places. JUnit unit tests should go in a directory named test under src. And Espresso UI tests should go in an androidTest directory under src. Note that under app/src, there are androidTest, main, and test directories. This way, you can always find the tests that test a particular class, because they have the same package name. For JUnit unit tests, you just need a very basic class. It doesn’t need to extend or implement anything. It should be public, take no parameters and return void. Test methods are annotated with @Test. These usually perform some action on an object and then make an assertion about that object’s state. You can also add a comment as the first parameter. This can be helpful when a test fails. The comment you entered will be displayed. Obviously, those are rather useless comments, but in some cases, it can be very helpful to document the intention. You can also add methods with @Before and @After annotations. The @Before method will be run multiple times, before every single @Test method, and the @After method will be run after every single @Test method is complete. These can be used to create and destroy objects or mock objects for tests, so the objects are always in a new, fresh state for each test, not in some changed state from the previous test. Then you need an ActivityTestRule. This specifies which activity you are testing. For each @Test method, Espresso will launch that activity, then run the @Before methods, then run the @Test method, then the @After method, then terminate the activity. So each @Test method gets the activity in its pristine, just launched state. There is also a ServiceTestRule if you want to test services. Then you set up @Before, @After and @Test methods the same as in JUnit. Perform an action on that view. Do an assertion on that, or some other view. For example, say you have a button that displays a particular view. You can locate the button, perform a click action on that button, and then check that the other view is now visible. There are other matchers as well. It’s important to make your matcher specific enough so that it finds a single view. If your matcher finds multiple views, you will get an error. There are other types of view actions – double clicks, long presses, back button, key presses, text input, gestures, etc. In other words, when the button is clicked, its text should change to “Pause”. So you look for a view that contains the text, “Pause” and if that exists and matches the view you just found, the test passes. Or you can check another view at that point. Click the closed caption button, then check if the captions view is displayed. There’s also an onData method that is used for adapter views. There are many other types of matchers, actions, assertions. This cheat sheet is useful. Once you have a test class with some test methods, you can run tests with Control-Shift-R. If your cursor is within a specific test method, it will run that one method only. If your cursor is outside of any methods, it will run the whole class. Once you’ve run a particular test method or class, it will show up in the configuration menu at the top of Android Studio and you can rerun it by selecting that and running as usual. It’s also possible to edit the configuration to change what is run, or create new configs. So you can programmatically process the failures and errors attributes within an automated build system.